Cui, Wenping Mehta, Pankaj and Garcia-Ojalvo, Jordi 2018. Identifying feasible operating regimes for early T-cell recognition: The speed, energy, accuracy trade-off in kinetic proofreading and adaptive sorting. PLOS ONE, Vol. 13, Issue. 8, p. e0202331. Hodgkinson, Arran Uzé, Gilles Radulescu, Ovidiu and Trucu, Dumitru 2018. Signal Propagation in Sensing and Reciprocating Cellular Systems with Spatial and Structural Heterogeneity. Bulletin of Mathematical Biology, Vol. 80, Issue. 7, p. 1900. Téllez, C. Nicolás Siachoque, José J. Siachoque, S. Juan Siachoque, J. María Alejandra and Siachoque, M. Heber 2018. T-cell activation, alterations in systemic lupus erythematosus: A narrative review. Revista Colombiana de Reumatología (English Edition), Vol. 25, Issue. 1, p. 38. Téllez Castillo, Nicolás Siachoque Jara, José Julian Siachoque Jara, Juan Sebastian Siachoque Jara, María Alejandra and Siachoque Montañez, Heber Orlando 2018. Activación de la célula T, alteraciones en el lupus eritematoso sistémico, una revisión narrativa. Revista Colombiana de Reumatología, Vol. 25, Issue. 1, p. 38. François, Paul and Altan-Bonnet, Grégoire 2016. The Case for Absolute Ligand Discrimination: Modeling Information Processing and Decision by Immune T Cells. Journal of Statistical Physics, Vol. 162, Issue. 5, p. 1130. François, Paul Hemery, Mathieu Johnson, Kyle A and Saunders, Laura N 2016. Phenotypic spandrel: absolute discrimination and ligand antagonism. Physical Biology, Vol. 13, Issue. 6, p. 066011. Carreño, Leandro J. Bueno, Susan M. Bull, Paulina Nathenson, Stanley G. and Kalergis, Alexis M. 2007. The half-life of the T-cell receptor/peptide?major histocompatibility complex interaction can modulate T-cell activation in response to bacterial challenge. Immunology, Vol. 121, Issue. 2, p. 227. Holst, Jeff Vignali, Kate M Burton, Amanda R and Vignali, Dario A A 2006. Rapid analysis of T-cell selection in vivo using T cell–receptor retrogenic mice. Nature Methods, Vol. 3, Issue. 3, p. 191. Chlewicki, Lukasz K. Holler, Phillip D. Monti, Bridget C. Clutter, Matthew R. and Kranz, David M. 2005. High-affinity, Peptide-specific T Cell Receptors can be Generated by Mutations in CDR1, CDR2 or CDR3. Journal of Molecular Biology, Vol. 346, Issue. 1, p. 223. Gronski, Matthew A Boulter, Jonathan M Moskophidis, Demetrius Nguyen, Linh T Holmberg, Kaisa Elford, Alisha R Deenick, Elissa K Kim, Hee O Penninger, Josef M Odermatt, Bernhard Gallimore, Awen Gascoigne, Nicholas R J and Ohashi, Pamela S 2004. TCR affinity and negative regulation limit autoimmunity. Nature Medicine, Vol. 10, Issue. 11, p. 1234. Krogsgaard, Michelle Huppa, Johannes B Purbhoo, Marco A and Davis, Mark M 2003. 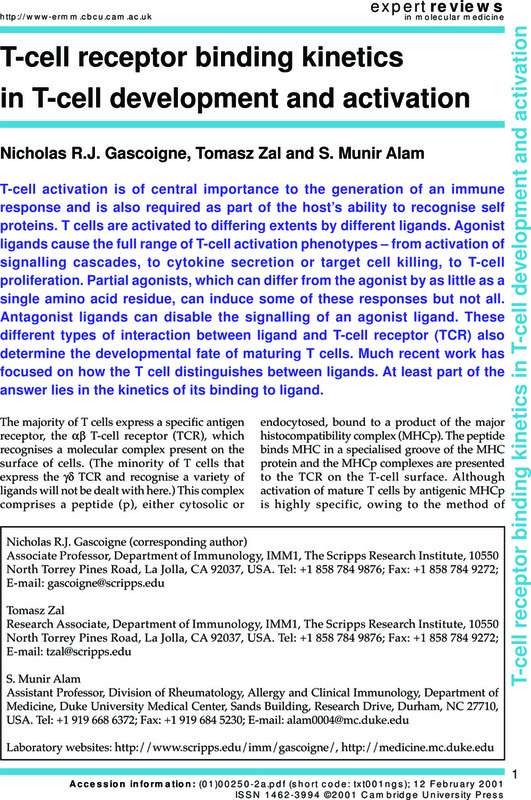 Linking molecular and cellular events in T-cell activation and synapse formation. Seminars in Immunology, Vol. 15, Issue. 6, p. 307. Department of Immunology, IMM1, The Scripps Research Institute, 10550 North Torrey Pines Road, La Jolla, CA 92037, USA. Division of Rheumatology, Allergy and Clinical Immunology, Department of Medicine, Duke University Medical Center, Sands Building, Research Drive, Durham, NC 27710, USA.